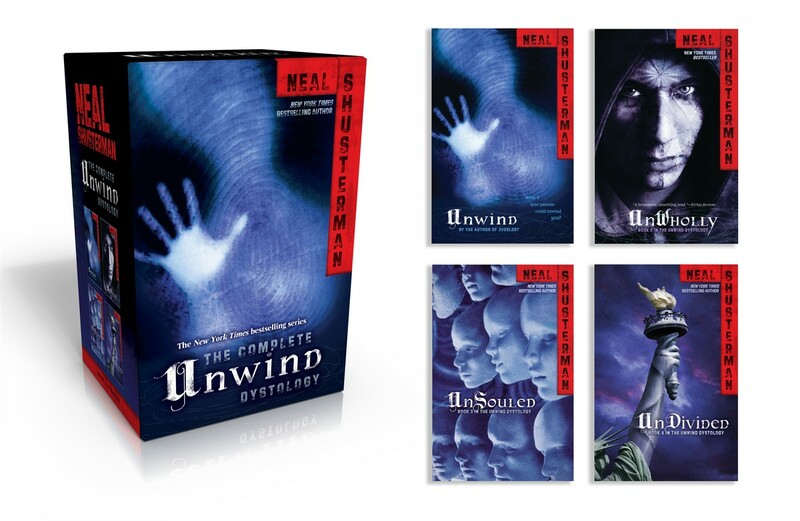 I’m an unlikely fan of Neal Shusterman’s Unwind dystology. I don’t normally go for the high-octane, super-intense, action-packed books. But I love this series. I loved the characters in this series. There are three main ones, although every book adds more POVs, more well-drawn characters. Connor, the Akron AWOL, on the run from his own unwinding; Risa, a ward of the state being unwound due to budget cuts; and Lev, a “tithe” who has been raised his whole life to believe that his unwinding will be giving his life back to God. This was a really thought-provoking series for me, and I’d love to talk it over with someone who has read it. What did you like? Did anything bother you about the ending? Who was your favorite character? Which scenes made you sick to your stomach? Was the premise hard for you to believe? Obviously, if you haven’t read this series, avoid the comments section due to SPOILERS! This entry was posted in book review, reading, YA and tagged review of neal shusterman's unwind dystology by Jackie Lea Sommers. Bookmark the permalink. \outl0\strokewidth0 \strokec2 \shad\shadx0\shady-20\shadr0\shado0 \shadc0 Jackie I couldn’t agree MORE with your description of this series. I’m totally liisting this as one of my all time favorite series. The characters were so wonderfully devloped and full of rich layers. I loved how I felt this way even after a bit of time between the novels. I am in awe how he could add characteers later in the series that I also fell in love with and cheered for and wanted to hear their perspective….Grace being of them-what a great character choice addition. Also this book had great underlying moral isssues that are facing our country now. The whole company that was for the greater good….oh how they thought just sent me shivers. I think this is one ofthe most believable “Future” United States of America that any Y.A has portrayed. Thiss series was just excellent and EVERYONE should read it especially adults.